There are different ways that algae can be used to create fuels and chemicals. The conventional way that most people talk about -- the conversion of algal oils to fuels -- will not be perfected for roughly a decade or so. A much better and more timely way of converting algae to fuels, is via thermochemical conversion such as pyrolysis or gasification. 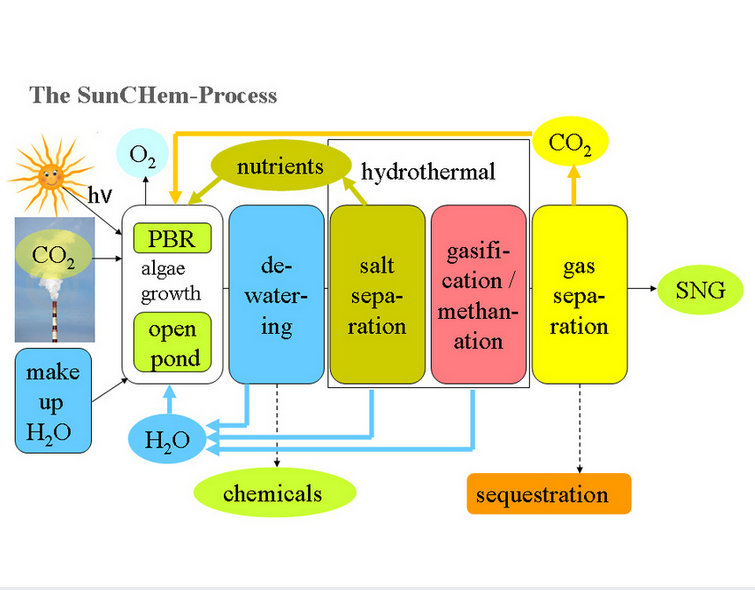 Swiss Scientists are attempting to perfect one method of converting algal biomass to methane: catalytic hydrothermal gasification and methanation, or SunCHem, pictured below. Algae have one notable advantage over other sources of biomass: they "grow" much more rapidly. In favorable conditions, they can generate 30-55 tons of dry matter per hectare per year – five to ten times more than sources such as corn, soy, or sugar cane. "And above all, they can be cultivated without soil, simply in bioreactors exposed to sunlight, thus avoiding the use of fertile croplands that are needed for food production," Ludwig adds. The process depicted above is similar in many ways to the approach preferred by Al Fin bioenergy engineers: IH2 catalytic pyrolysis. The biggest problem Al Fin analysts see with the SunCHem approach, is its plans to use expensive bioreactors, rather than much cheaper troughs or ponds. Growing algae for its biomass is much different than growing algae for its oil. With the biomass approach, you do not need to use expensive genetic engineering or maintain isolation of specific algal species. Instead, you are aiming for maximisation of biomass production, which may well occur with wild strains or mixed strains of algae. Another problem with the process as pictured, is the dependency on methane to provide energy to the process. This parasitic use of methane to produce methane reduces yields and potential profits. Much better to find another, cheaper source of energy to drive the process. As long as geological methane is relatively cheap, producing bio-methane makes little sense. Much better would be to produce diesel, gasoline, jet fuel, and high value chemicals from the algae. That is the approach taken by those who plan to utilise IH2 pyrolysis and similar approaches. Since algae is one of the most prolific producers of biomass known, and since we have the technology to convert biomass to methane at relatively high yields, it makes sense to optimise this technology for the future, when methane is likely to become a key centre-piece for the energy economies of many nations -- at least in nations that reject nuclear energy. But how much more efficient it would be to utilise nuclear process heat to carry out biomass to fuels or biomass to chemicals conversions! The antinuclear hysteria which has infested Germany, Switzerland, Japan, Italy, and other advanced nations, is incredibly destructive to their future well-being. Much better for them to embrace the inevitability of nuclear power for the long term, and to work hard to develop cleaner, safer, more affordable and scalable forms of advanced nuclear power -- both fission and fusion.